Personalized Glass Tic Tac Toe Game Set Custom Printed in Bulk. Promotional, Very Inexpensive. Lowest prices in the USA and Canada. 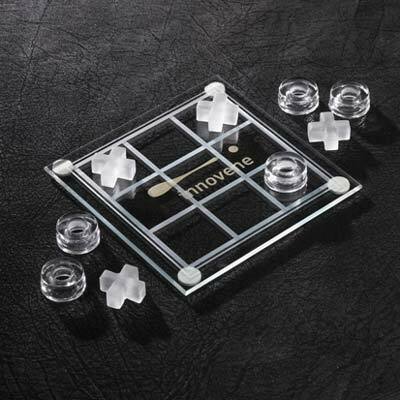 High quality, yet inexpensive Glass Tic Tac Toe Game Set in bulk, customized with you logo. We also supply blank (not personalized) Tic Tac Toe Game Sets for $9.25 each (minimum quantity: 25). Free artwork design and Free proofs! American clients pay no taxes. The unit prices below include your 1-color custom imprint on one side. Additional imprint colors are not available. We also supply blank (not personalized) Tic Tac Toe Game Sets for $9.25 each (minimum quantity: 25). PRODUCTION TIME: 7-10 days after art approval; Rush production is available: contact us. Blank items ship next day. • Easy Game…Easy Price…Have some FUN!!! Imprint Method: sand etch imprint in one location. Imprint Area: 1" H X 3" W. Unless otherwise specified on your P.O., we will imprint in the direction shown here.